Israel Requests Recognition From U.S.
Letter from Provisional Government to the U.S. 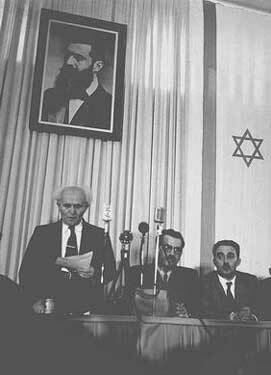 The Declaration of the Establishment of the State of Israel was approved at a festive session of the Peoples Council, comprised of representatives of the yishuv (the Jewish community in Palestine) and the Zionist movement, on Friday, May 14, 1948, several hours before the British Mandate for Palestine came to an end. Proclaims the establishment of a Jewish state in Eretz Israel, named "the State of Israel." The second section of the Declaration, one sentence long, addresses the normative aspect of Israels establishment: it states that it is the natural right of the Jewish people to be like any other people, exercising self-determination in its sovereign state. The importance of this second section is in the assertion that the establishment of the state is based on the natural right of self-determination and is not subject to decisions of other states or international organizations. Nevertheless, the next section, the declarative one, rests in part on the UN General Assembly resolution. The third section, one paragraph long, is the proclamation of the establishment of the State of Israel, and it is the most important operative part of the Declaration. The rest of the document can be seen as supportive elaboration. From an international legal point of view, this section alone would have sufficed. The precise text here reads "...the establishment of a Jewish State in the Land of Israel - the State of Israel." The precise meaning of the term "Jewish state," which recurs four times in the Declaration, has since prompted much public debate, which has recently grown in intensity. However, at the time of the writing of the Declaration, this had hardly occasioned either discussion or questions. It seemed clear that the reference was both to the "Jewish state" mentioned by the UN Resolution, and to the state of the "Jewish people," mentioned several times in the Declaration as am yehudi ("Jewish people"), and once each as am yisrael ("people of Israel") and ha‘am haivri ("the Hebrew people"). The fourth section, the institutional part of the Declaration, sets forth the time for the beginning of independence and the operation of the states institutions – in fact, their continuing operation under new names. This section also states that a constitution is to be enacted by an elected constitutional council, and that governmental institutions are to be elected in accordance with the constitution. Finally, a date is set for the inauguration of these bodies: October 1, 1948. These details and the timetable were stipulated so as to correspond to the provisions of the UN resolution in these matters. It is true that the word "democracy" does not appear in this impressive list, but there can be no doubt that the Declarations authors and signatories intended to establish an exemplary democratic regime. Perhaps they thought that the rest of the documents contents made it unnecessary to cite "democracy" specifically. The sixth section of the Declaration includes appeals for the cooperation of both external and internal factors. The internal factor – "the Arab inhabitants of the State of Israel" – is called upon to preserve peace and participate in the building of the state. Full and equal citizenship – implying, first and foremost, due representation in all state institutions – is conferred on them. The phrasing of the appeal makes it clear that it is addressed to an Arab people. The significance is that although the state is Jewish, it is inhabited by two peoples. It should be stressed here that the term "Palestinian" had not yet become prevalent at that time. The appeal for peace and good neighborly relations is addressed to all neighboring countries and peoples and is manifested in the assertion of Israels willingness to make its contribution toward development of the Middle East. The timing of this message is worth bearing in mind, for the country had endured half a year of a very violent struggle and Arab armies had already begun to invade it, wishing to prevent Israels independence. 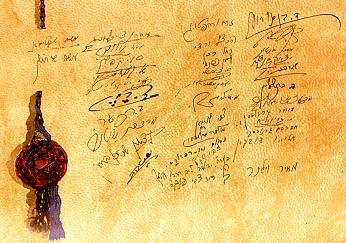 The seventh and last section of the Declaration, the part containing the signatures, begins with the phrase: "Placing our trust in the Rock of Israel, we affix our signatures..." It comes as no surprise that these opening words had prompted a debate among the members of the Peoples Council, reflecting the disagreements between its secular and religious members concerning the future image of the state. The debate ended in tacit acquiescence, presumably because of the reluctance to engage in such a discussion at that time. It should be mentioned, however, that the representatives of the haredi (ultra-Orthodox) community subsequently took exception to the entire Declaration, stating that it greatly offended their sensitivities. At the festive session that approved the Declaration, the newly proclaimed state (which, strictly speaking, had not yet come into existence at that moment) passed its first legislative act: the Manifesto, whose name and format have no parallel in the Israeli lawbooks. According to the legal experts of the time, this document was needed because the Declaration itself, although equipped with a quasi-legislative section that stipulated the inauguration of the states provisional governing institutions, amounted to a public proclamation and was not an authentic legislative act. Indeed, the first paragraph of the Manifesto repeated the Declaration by stipulating the Provisional Council of State as the legislative authority. However, it also authorized the Council to devolve some of its powers to the Provisional Government for the purpose of urgent legislation. This provision was considered essential under the military circumstances of the time, enemy forces having already invaded Israels territory in certain locations. This legal option of main legislation by the executive branch, which had first been introduced in the Manifesto, still exists, although it has been substantially modified and curtailed. It was enacted by the Law and Administration Ordinance, passed about a week later, and is now contained in the Basic Law: The Government. The continuity provision was copied almost verbatim into Paragraph 11 of the aforementioned Law and Administration Ordinance, which was, in fact, Israels first regular statute. Since that resolution was adopted, the Knesset has passed eleven basic laws (two of them – Basic Law: The Government and Basic Law: Freedom of Occupation – have been passed twice). This effort is not yet complete, although it is commonly thought that most of the constitutions chapters (i.e., the Basic Laws) have been enacted and that the missing ones will soon be ready. The purpose of this Basic Law is to protect ..... in order to establish in a Basic Law the values of the State of Israel as a Jewish and democratic state. Since the passage of these two Basic Laws, these two definitive characteristics of the state – the Jewish and the democratic – have been inextricably intertwined. However, if the legislators had hoped that this formulation would put to rest the debate over Israels being Jewish and democratic, the opposite occurred. From the moment these Basic Laws were passed, public debate over this issue and its implications has recurred, and more vehemently so. Some argue that national harmony requires a full symbiosis between these two adhesive attributes, and they consider such a symbiosis not only necessary but also possible. Others believe that the two values clash in substantive ways and cannot be attained in tandem. Thus, they say, one must yield to the other: either democracy to Jewishness or vice versa. The continuum between these polar attitudes is filled with a great many views pertaining to every substantial issue on the public agenda. Some even consider the two values unequal in status a priori, citing the order in which the two determining words appear in the foregoing clause. Recently, the domestic dispute over the Jewish character of the state has become very bitter. Dissent ranges from the conceptual and the ideological to the practical – Sabbath observance, marriage and divorce laws, budgets for religious institutions – with a tendency to adopt radical and excessively rigid positions. Furthermore, the political arrangements governing the status, powers and functions of religion (called the "status quo on religious affairs") are steadily crumbling amid rising social tension. A large majority of Jews take for granted that Israel is a Jewish state and cannot envisage anything else. Although quite a few would prefer to see a different Jewish state – with disagreements over the degree of difference – only a very small minority would seek to abolish it. Many of the countrys Arab citizens acknowledge that Israel is a Jewish state and will remain so, and some regret this. Be this as it may, there can be no doubt that on the day when Jews cease to be a majority in Israel, Israel will cease to be Jewish. The most important section of the Declaration is that dealing with values and principles, which contains political and legal messages that remain relevant to this day. It is still Israels charter of human and civil rights, enfolding all the basic principles and values that no enlightened society can do without. Obviously, there are abundant disparities, even gaping ones, between ideals and realities, between promises made and promises honored. For this reason, as this article draws to a close, an attempt should be made to determine which of the promises in the Declaration have been fulfilled and which have not. Of course, it is impossible at this juncture to draw up a detailed, accurate, and reasoned "balance sheet," but one may briefly address – at the risk of being accused of excessive brevity – the development of several of these principles in the reality of Israel. A fundamental aspiration of Zionism and the state, this may be viewed – in the most general way – as a success story, though not everyone would agree. The Law of Return was enacted to give concrete legal form to this cause and, despite criticism of its details, it is hard to envisage the State of Israel without it. The main emphasis has been on the stage of "the ingathering of exiles," the arrival and attraction of faraway Diaspora communities. It was accompanied, perhaps unavoidably, by severe hardship for many immigrants, and the ensuing social inequalities have left scars. Although the Declaration says nothing about integration of exiles and national solidarity, this is obviously the "heart and soul" of the ingathering, and the balance in this respect is far from being fully satisfactory. Those who regard Jewish immigration not only as a right, but also as a duty, probably regard it as at least a partial failure. Even today, more than half of the worlds Jews do not live in Israel, and the number of emigrants leaving Israel is growing; however, the proportion of world Jewry living in Israel is on the rise. In this matter, too, Israel may congratulate itself for making much progress and attaining an impressive rate of development. The state is among the worlds most developed with regard to economy and culture. Its standard of living and quality of life have been rising steadily, despite the impediments of its security situation. All citizens have benefited from these trends – though not equally, as Israel is one of the few developed countries in which the income gap is actually widening. These universal values, in the absence of which a society cannot be sound nor a state enlightened, account for a hefty portion of the Jewish heritage; a Jewish state not guided by them is inconceivable. Although nobody fails to espouse these values, Israelis from all sectors of society have widely varying interpretations for them. This state of affairs is most conspicuous with respect to peace, of course, but it also applies to liberty and justice. Under such circumstances, it is quite amazing that a golden mean, or at least a workable compromise, is so often attained. In this sense, Israels performance does not outrank the soundest of nations, but it does not fall significantly short of them. The Equality of Womens Rights Law (1951) was meant to make the Declarations assurance in this respect effective. The statute indeed prescribes legal equality for men and women in all matters of jurisprudence, and adds that any legal provision that discriminates against women qua women shall not be applied. Indeed, much action toward greater equity has been taken over the years, in both judicial and social affairs. However, this law makes a significant exception: in all matters of marital status, womens equality does not apply. Indeed, this exclusion has been expanded to cover all matters related to so-called religious institutions of state, such as rabbinical courts and religious councils, with some minor exceptions. Truth to tell, however, even the law prescribing equal wages for men and women (1964) falls far short of full implementation. The Declaration speaks of equal rights and refrains, for good reason, from speaking of equal obligations. However, a soundly functioning regime obviously concerns itself with this aspect, too, for it is also a factor in equality. Israel is not among the worlds most egregious performers in its infringements of this principle. Nevertheless, there have been occasional grievances, and public debate sometimes erupts over a case of inequality in obligations. Equality, or, to be more accurate, more equitable justice in apportioning the tax burden is the subject of struggles all over the world, and let us admit that Israel has much room for improvement in this respect – not only concerning women. Another matter that has evoked bitter public controversy for some time is equality in carrying the burden of military service, especially in what we call the induction of yeshiva students. The duration of annual reserve duty also remains irksome to many in this respect. Court judgments have expanded the freedom of religion significantly by including in it the freedom from religion. Thus the courts have stipulated that both freedom of religion and freedom from religion, to which both citizens and residents are entitled, are overarching values in Israel – originating in the rule of law (in its substantive sense) and in rulings by the courts. Religious commandments – or religiously derived principles – are not law in Israel unless they are incorporated into a law. However, one can hardly say that the governments performance has always studiously corresponded to the spirit of this ruling, and the tendencies emanating from steadily-growing population groups are also pointing in other directions. The authors of the Declaration had a similar situation in mind when they referred to freedom of education, and presumably they also intended to enshrine the right of all "streams" in Jewish education. On this basis, parents were eventually granted the possibility of enrolling their children in education subsystems of their choice. Obviously, freedom of education was not meant to empower every parent to dictate his childrens curriculum nor to teach at home, in circumvention of all school settings (although a quite liberal interpretation of the relevant statutes has allowed such cases). Indeed, a large majority of Israelis accept what they are offered in this regard. This may also be indicative of a basic rule with respect to rights: use them or prepare to lose them. Recently, problems have arisen because of schools refusal to honor parents freedom to choose their childrens education by rejecting certain children without justifying the rejection on any formal grounds. The countrys holy places, and the free access to them, primarily those of Muslims and Christians, have been safeguarded very meticulously, especially since many such shrines came under Israeli control after the Six-Day War. This situation has been noted favorably by most religions represented in Israel, despite occasional incidents. We are witnessing today, thus, the continuing development of the democratic State of Israel, based on the values of freedom, justice and peace, as cited in the Declaration. Furthermore, the Declarations calls for "bonds of cooperation and mutual help" and "a common effort for the advancement of the Middle East" are being realized in the continuing peace process between Israel and her Arab neighbors.